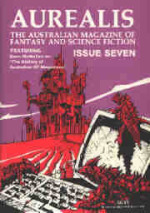 Aurealis is a showcase for the best in Australian science fiction and fantasy. Our only criterion is excellence. 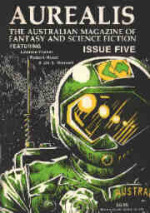 In our short time in the field, we have already published stories which span many of the great themes of speculative writing: time travel, space flight, alien environments, dystopias, technological change, sentient machines, genetic manipulation, mythical beasts, night creatures and alternative realities. Already our list of authors has spanned the continent  all six states and the ACT have been represented, giving Aurealis a truly national flavour. 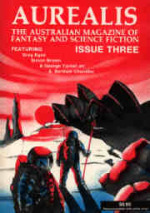 As most of our readers have probably realised, Aurealis is about fiction. We will publish the occasional article  like the George Turner interview in issue one  but we will be concentrating on short stories. We want to publish as many Australian writers as possible, as often as possible, and we want to get their stories read by as wide an audience as possible. In the following pages you will journey from the pure fantasy of Peter Trueman's "The Hunt" to the stark realism of Stephen Higgins' "Vignette", from Stephen Dedman's chilling scenario in "But Smile No More" to Jodie Kewley's whimsical fantasy "The Tree". You will travel from Pauline Ranscombe's humour to the brutal logic of Simon Brown's tale, from the poetic elegance of Rosaleen Love's "Hovering Rock" to the hard-edged story-telling of Paul Collins. The Damien Broderick story featured in this issue has had a complicated genesis. Broderick's first ever sale was a novella entitled The Sea's Furthest End, written when he was 18. 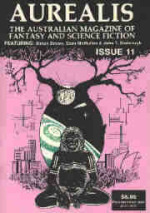 British editor, John Carnell  founder of New Worlds magazine  published it in 1964 as the major story in his first volume of New Writings in SF. Looking back recently at this fledgling effort, Broderick felt it cried out to be brutally edited, given a thoroughly developed background, and extended to novel length. Like the original, it is unashamedly romantic, over-the-top space opera. The Sea's Nearest Shore is a self-contained section, entirely new, from the opening of that novel. 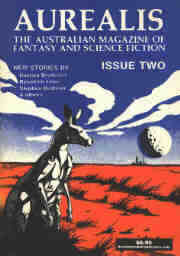 In the following pages there are nine glimpses into the world of Australian fantasy and science fiction  enjoy! …The Tyrant showed her white teeth. Perhaps it was just the smile of a mother for a daughter. Jack Menzies looked up from a scanner. The LED readout put the intruder right at his door. "I've been expecting you," Menzies said. He sounded like a school teacher addressing a student. …Jim just stood and stared at me … as if he were trying to talk to me with his eyes. With hindsight I realise that this is exactly what he was trying to do. His mind wanted to communicate something, but his implant still had enough control to stop him. I hustled him behind one of the boxes. "Stop it. Go away!" He still just looked at me. "What do you want?" I said. "Why are you picking on me?"